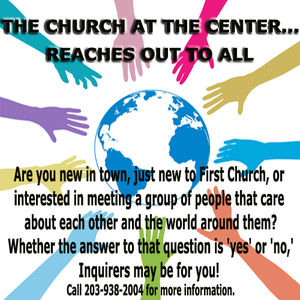 INQUIRERS: Are you new to First Church? Whether the answer to that question is 'yes' or 'no,' Inquirers may be for you! If you would like to become better acquainted with fellow explorers and our minister, to learn about the history and faith perspectives of our Congregational/United Church of Christ heritage, to reflect on our respective journeys of faith, and to explore the option of uniting in a covenant of membership with our church family, you may be interested in a three-part series that is open to all. Part II: The Story of First Church, Redding & Our Mission to Serve, will be Sunday, April 28, from 12:00 – 1:15 PM. Part III: The Covenant We Share & Becoming a Member of First Church, will be Sunday, May 5, from 12:00 – 1:15 PM. Celebrating/Welcoming New Members, will be Sunday, May 19, 10:00 AM (during the morning worship service).